The last few weeks have been very busy for me, the Volunteer Archivist for the Burnley Archives Collection. 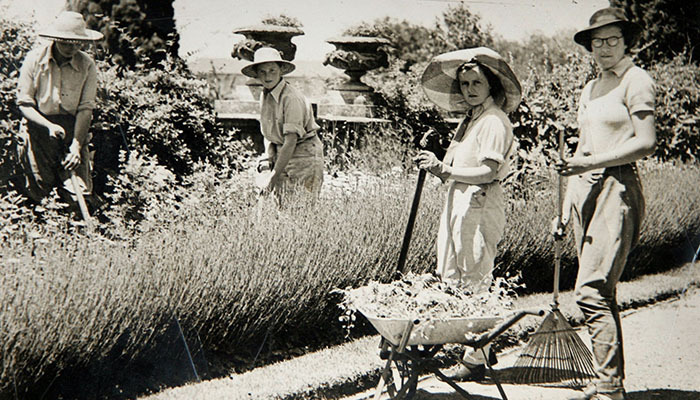 The Burnley Campus is celebrating this year 125 years of continuous horticultural education and it has been 25 years since the Archives were formally set up. The Archives were established when A. P. Winzenried was commissioned to write a history of the Burnley Gardens and material had to be gathered and put together for him to use. All past students and staff who could be found were asked to send in memorabilia and what a treasure trove arrived. Hundreds of photographs, letters, documents, artefacts, registers and student work had to sorted and stored. The book was written and cataloguing started but there was far too much to be dealt with quickly. Elizabeth Hill became the first Volunteer Archivist and established the cataloguing system. Two former Principals endeavoured to describe the old photographs and recall events from the past. Joss Tonkin, another volunteer, assisted Elizabeth Hill and later took over when Elizabeth retired from her voluntary position. At this time the Archives were stored under the roof in an old wooden building that had once been the Dairy. It was very hot in the summer and cold in the winter; not ideal conditions. I remember as a trainee Guide for the Friends of the Burnley Gardens in about 2005 visiting Joss and having to put on white gloves while she showed us some of the treasures like enormous registers with handwritten lists of the hundreds of fruit trees that had been planted in the Orchard in the 1870s or the jodhpurs that the girls wore as their uniform in the 1920s. By 2009 Joss wanted to give up her voluntary position and I offered to take over. It was a daunting prospect – there was so much work still to be done and it had been decided to move the material to the Main Administration Building where conditions were better. They are now housed in what had been the girls’ changing rooms. My first task, after moving everything out of the Dairy, was to catalogue onto a spreadsheet and digitise the photographs. I have been doing this for over six years now and I am still not finished as I have been encouraging people to keep donating material to the Archives and every time an office is cleared out I go in searching for more. One particularly hot summer found me in the former Egg Curator’s house rummaging through the recycling bins to find things I thought worth archiving. The other reason why cataloguing is such a slow process is that the Burnley Archives are used by staff, students, museums and the general public on a regular basis. The University of Melbourne Archives is progressively cataloguing descriptions of the Burnley Archives holdings into its database but most of the catalogues and photographs are still not accessible other than from the computer in the Burnley Archives. There are, however, more volunteers working in the Archives now. Judith Scurfield, former Head of Maps at the State Library, does cataloguing and helps me with general advice, Mary Eggleston, a former science teacher helps with general packaging of maps and sorting, and Ala Shtrauser, former Assistant Librarian at Burnley sorts photographs and identifies people in them. A typical day would have me looking for and emailing photographs of someone’s mother who had been a student in the 1930’s – and reading the grateful email in reply. A student might ask me for plans of a garden area and any additional documents we had. A staff member might ask me to talk to a group of students to let them know what was available for them to use. A very regular visitor to the Archives is the Garden Co-ordinator, Andrew Smith. The Burnley Gardens are Heritage Listed and he has to maintain them under strict controls. This means that every time he replaces a plant or does any work in the Gardens he has to refer to the Archival documents and photographs. We can literally spend hours looking at photographs deciding where and when they were taken and whether that area could be restored to its original condition. We are continually adding to our knowledge of the history of the Gardens and College. So much of it is oral history and it has to be recorded now while those with memories are still alive. The Friends of Burnley Gardens was set up in the late 1990s in part to provide funds for the maintenance of the Gardens. In recent years much work by the FOBG has gone into gathering together information, much of it oral, on the people who have been involved in designing different parts of the Gardens. As a joint venture between the University and the Friends an app is being prepared to enable visitors to Burnley Gardens to walk around listening to the rich history of the Gardens and College and descriptions of some of the interesting plants. At the moment I am also assisting staff prepare for their entry in the Melbourne International Flower and Garden Show in March where they are presenting a snapshot of Burnley’s influence on garden design. I also conduct tours for the Friends of the Burnley Gardens. Come and visit us.